"Machine Motion is the perfect joint formula for everyone! It contains Acumin, the most advanced turmeric for the ultimate in joint health, alongside Q-Actin, an exciting new joint care ingredient scientifically proven IN HUMAN STUDIES to work BETTER than the now obsolete combination of glucosamine and chondroitin. Alongside FULLY LOADED doses of Cissus Quadrangularis, Hyaluronic Acid and Bioperine, I created Machine Motion to be perfect for myself and EVERYONE ELSE - even Vegans and those allergic to shellfish!" Heralded far and wide for its countless benefits, cissus quadrangularis is one of the most powerful all-natural joint support supplements available. Cissus is rich in a type of plant sterol known as ketosterones. These phytochemicals are responsible for the numerous benefits of cissus supplementation. 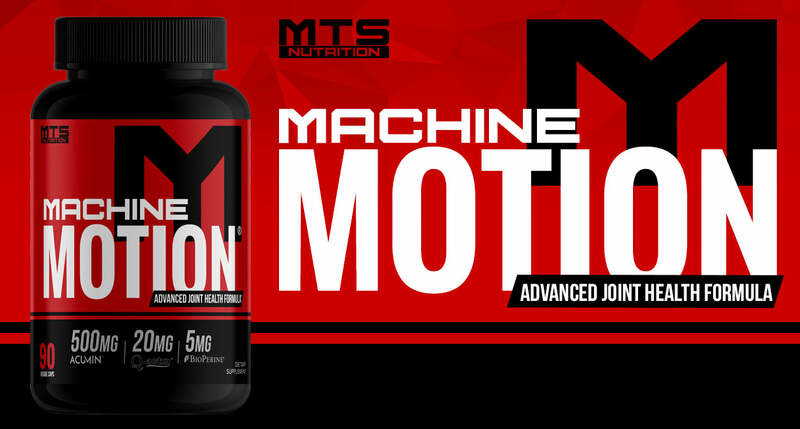 Machine Motion includes a premium-grade cissus extract standardized to 40% ketosterones. Cissus supplementation has been well-documented to combat inflammation, relieve joint pain, and promote collagen synthesis. [1,2,3,4] This is all in addition to its ability to enhance weight loss and cholesterol levels. Developed by Novel Ingredients, Acumin™ is a trademarked extract of curcumin supplying 45% curcuminoids. This one-of-a-kind complex has been clinically shown to offer 5-6x greater bioavailability than conventional curcumin supplements. Machine Motion utilizes one of the newest, groundbreaking joint support supplements in Q-Actin, a patented, clinically-tested extract of cucumber. Research conducted on the novel extract demonstrates it significantly improves knee pain, stiffness, and physical function in patients suffering from osteoarthritis. Doses used in the landmark study were 20mg, the exact same dose included in Machine Motion! Q-Actin is able to accomplish this by inhibit the production of TNF-?, tumor necrosis factor alpha, an inflammatory cytokine associated with a number of inflammatory diseases including osteoarthritis. [15,16] Reducing factors that promote inflammation promotes increased range of motion, decreased pain, and improved quality of life. All the joint support compounds won’t do a lick of good if you’re body isn’t able to utilize them. That’s where BioPerine® comes in. This industry-leading black pepper extract improves ingredient bioavailability, ensuring maximal uptake and utilization by the body. BioPerine inhibits various enzymes preserving ingredient integrity, certifying you get all the joint pain relief possible from each and every serving of Machine Motion. 1. Bloomer RJ, Farney TM, McCarthy CG, Lee S-R. Cissus quadrangularis reduces joint pain in exercise-trained men: a pilot study. Phys Sportsmed. 2013;41(3):29-35. doi:10.3810/psm.2013.09.2021. 2. Ferrandiz, ML, and MJ Alcaraz. “Anti-inflammatory activity and inhibition of arachidonic acid metabolism by flavonoids.” Agents and actions 32.3-4 (1991): 283-288. 3. Lin, J et al. “Preliminary screening of some traditional Zulu medicinal plants for anti-inflammatory and anti-microbial activities.” Journal of Ethnopharmacology 68.1 (1999): 267-274. 5. Nutrition TR. Acumin Ingredient Information. http://www.novelingredient.com/wp-content/uploads/2016/07/Acumin-Sell-Sheet.pdf. > 8. Zatuchni GI, Colombi DJ. Bromelains therapy for the prevention of episiotomy pain. Obstet Gynecol. 1967 Feb;29(2):275-8. 9. Brien S, Lewith G, Walker AF, Middleton R, Prescott P, Bundy R. Bromelain as an adjunctive treatment for moderate-to-severe osteoarthritis of the knee: a randomized placebo-controlled pilot study. QJM. 2006 Dec;99(12):841-50. 10. Brien S, Lewith G, Walker A, Hicks SM, Middleton D. Bromelain as a Treatment for Osteoarthritis: a Review of Clinical Studies. Evid Based Complement Alternat Med. 2004 Dec;1(3):251-257. Epub 2004 Oct 6. 12. Bannuru, R. R.; Natov, N. S.; Dasi, U. R.; Schmid, C. H.; McAlindon, T. E. (2011). "Therapeutic trajectory following intra-articular hyaluronic acid injection in knee osteoarthritis – meta-analysis". Osteoarthritis and Cartilage. 19 (6): 611–619. doi:10.1016/j.joca.2010.09.014. PMID 21443958. 13. Salk, R. S.; Chang, T. J.; d'Costa, W. F.; Soomekh, D. J.; Grogan, K. A. (2006). "Sodium Hyaluronate in the Treatment of Osteoarthritis of the Ankle: A Controlled, Randomized, Double-Blind Pilot Study". The Journal of Bone and Joint Surgery. 88 (2): 295–302. 14. Nash R, EFFECTIVENESS OF Cucumis sativus EXTRACT (CSE) VERSUS GLUCOSAMINE-CHONDROITIN (GC) IN THE MANAGEMENT OF OSTEOARTHRITIS: A RANDOMIZED CONTROL TRIAL. J Gerontol Geriatr Res. 2017;6(3):7182. 16. Google Books. (2018). Patent WO2015150966A1 - Food supplement composition comprising a cucumber (cucumis sativus) extract.